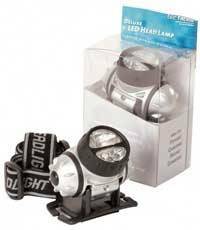 A must-have for night fishing this Deluxe Headlamp keeps your hands free directing the light exactly where it is needed so you can tie knots, land fish or tinker around with your boat. The Deluxe Headlamp has 10 LED lights for extreme lighting power but gives you the option of low (3 LED) medium (6 LED) or high (all 10 LED) settings so that you can vary the power for battery conservation or desired levels of lighting. Clip-on articulating LED head focuses light where you need it. Low profile design wont block your view.  Clear polycarbonate clip works on all hats and is virtually indestructible.  Removable light module doubles as a hand held flashlight.  Split ring on the case provides easy attachment to key rings.  Uses two (2) CR2032 and runs for over 36 hours continuously. 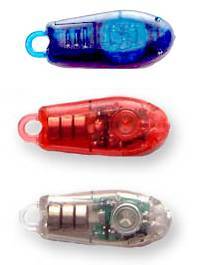  Batteries are included and available where most batteries are sold.  Three way light switch includes: 1. Two ultra bright white LEDs 2. Single red LED 3. Single flashing red LED (mount on back of hat as a safety feature.